The preliminary entry list sees 43 cars for 40 spots, meaning that three cars will miss the show in qualifying. This is up two cars from the series’ most recent round at Dover on May 5. Ty Dillon steps in for Jeb Burton as the first of four Cup drivers to run double-duty this weekend in Charlotte. It will be Dillon’s fourth XFINITY start of the season and his first since a 12th-place showing in Texas. Welcome back Tommy Joe Martins, set to make his first XFINITY start since a season-best 18th-place showing in Talladega. Martins takes the place of Ray Black, Jr., who ran 27th in his own return at Dover, but now runs McLeod's #78 (see below). It will be Martins’ first XFINITY start at Charlotte since 2014, when he drove his own Martins Motorsports Dodge to a 31st-place finish. Timmy Hill not entered in the XFINITY race, nor is Motorsports Business Management’s third car, which returned at Dover earlier this month. Instead, Hill will run MBM’s Cup car on Sunday, following-up his ride in last Saturday’s Monster Energy Open. Kyle Busch steps in for Noah Gragson with NOS Energy Drink as sponsor. Brad Keselowski gears up for his first XFINITY start since he took the checkers at Phoenix, taking the place of Austin Cindric. Cindric is not entered in Saturday’s race. As Spencer Gallagher continues NASCAR’s “Road to Recovery,” Chase Elliott steps into his ride in place of Johnny Sauter and brings with him sponsorship from Hooters. The sponsorship is part of a promotion with the restaurant chain’s 22nd International Pageant. It will be Elliott’s first XFINITY start since this year’s Daytona opener, where he ran 12th for JR Motorsports. As announced a week ago Tuesday, JGL Racing has suspended operations of the #24 team and released driver Kaz Grala. As announced the following Friday, Grala makes the move to the new Fury Race Cars LLC (see below). JGL’s #28 remains entered with Dylan Lupton. The next Cup regular is Jamie McMurray, set to make his third XFINITY start of the year and first since his 7th-place showing in Texas. McMurray, who has not made an XFINITY start at Charlotte since 2010, takes the place of John Hunter Nemechek, who drove the car the last four straight weeks with a best finish of 7th at Talladega. On Tuesday, it was announced that Stephen Leicht was released from the #55 team, citing differences of professional opinions. In his place comes Brandon Hightower, whp we last saw run XFINITY for Motorsports Business Management at Fontana in 2017. JP indicates Hightower will run the car the rest of the year. Josh Bilicki remains his teammate in the #45. A new XFINITY Series team hits the track this weekend as Tony Eury, Jr.’s Fury Race Cars LLC fields their first top three division entry for the released Kaz Grala. As reported last week, Grala will be in the car for Charlotte and the three races after, building on the experience of the Fury brand’s short track and modified car business dating back to 2016. NETTTS follows Grala to this new team as sponsor. If the team qualifies on speed, it will mark the first XFINITY Series start for the #61 since August 7, 2010, when Chase Miller ran 39th at Watkins Glen for car owner Charles Shoffner. Team owner Mike Harmon returns to the seat of his #74, taking the place of Cody Ware, who failed to qualify after an on-track incident at Dover. Harmon has 8 XFINITY starts at Charlotte with a best of 29th in 2015. The team’s car is listed as a Chevrolet after fielding their Dodge since Bristol. On top of Tommy Joe Martins returning to action in McLeod's #8, McLeod himself isn't running his typical #78 this Saturday. In his place is Ray Black, Jr., who ran the #8 its last time out in Dover. McLeod instead runs the team's #99, which returns to action (see below). Josh Williams returns to the XFINITY Series for the first time since Talladega, taking the place of Brandon Brown in Mario Gosselin’s #90 Star Tron Star Brite / Sleep Well Chevrolet. This will be Williams’ first XFINITY start at Charlotte. The Biagi DenBeste #98 team returns to the XFINITY circuit for the first time since Talladega, where Chase Briscoe finished 16th. Briscoe is again the driver this Saturday, looking to make his 6th start of the season. Briscoe’s most recent race at Charlotte was last summer’s Truck Series event, where he ran 11th for Brad Keselowski Racing. B.J. McLeod’s team returns to a three-car operation for the first time since this year’s opening three rounds, where Ray Black, Jr. failed to qualify at Daytona, and the car was withdrawn in the next two races at Atlanta and Las Vegas. McLeod himself drives it this time around. For the first time since Talladega, three races ago, and for just the third time in 2018, there will be a 40-car field in Sunday’s Memorial Day classic. In fact, there were originally 41 drivers entered to attempt that field, a first since Bristol last August. Following Wednesday's withdrawal of the second Rick Ware car, qualifying will once again be a formality. A picture circulated on Instagram Monday showed a rendering of a new Cup Series effort for 2018. In the post, the NY Racing Team, formerly Johnathon Cohen’s Team XTREME Racing, announced they would be returning to Cup competition in Sunday’s 600. 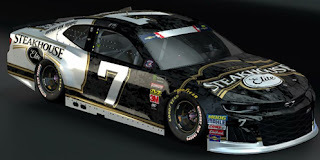 The black-and-white #7 Chevrolet carried sponsorship from Steakhouse Elite and listed J.J. Yeley, one of Team XTREME’s former drivers, behind the wheel. Despite a “multi-race, multi-year deal” on the post, the #7 was not on the preliminary entry list. But by Monday night, it was confirmed through several sources that the #7 team had been added. As it stands, Cohen’s team hasn’t made a Cup start since Reed Sorenson’s 32nd-place showing in the 2015 Daytona 500 and the subsequent controversy behind the team’s backup car hauler being stolen in Atlanta. BK Racing’s sponsorship issues have persisted this month. The team carried a multi-colored wrap at Kansas without a primary sponsor, then reverted to #23 decals on the featureless black undercoating in last week’s Monster Energy Open. This week, the team carries another unsponsored wrap similar to the one at Kansas, but in patriotic red white and blue. Gaulding finished 27th in this race last year for BK, then 36th in the fall for Premium Motorsports. Rick Ware Racing was set to debut their new second team this week with B.J. McLeod driving, moving over from the #51 he's driven at Kansas and the Monster Energy Open. By Wednesday, the team withdrew. Its next entry is to be announced. Welcome back Jeffrey Earnhardt, who returns to Cup competition for the first time since he was released from StarCom Racing after Fontana. This time around, he takes the place of Reed Sorenson in the "open" #55 with several sponsors, including Black Rifle Coffee Company, Nine Line Apparel, Xtreme Concepts, Inc., and the Angels of Amerca's Fallen foundation. After running without a primary sponsor, Corey LaJoie receives backing from MyFreedomSmokes.com, which was last in NASCAR in 2014, backing a pair of runs by Jake Crum in the Camping World Truck Series. The #72 will be one of the most unique patriotic cars in the field, decorated like a World War II-era bomber. LaJoie made his first Coca-Cola 600 start last year for BK Racing’s shuttered “open team,” the #83, turning in a 32nd-place finish. As announced earlier this month, Parker Kligerman is set to attempt his first Cup Series start since April 12, 2014, when he finished 30th at Darlington for the now-defunct Swan Racing. Kligerman has since found success in both the XFINITY and Truck Series, and will drive in place of D.J. Kennington in a #96 Toyota for the Gaunt Brothers. The team still lacks a primary sponsor, though radiator company Spectra Premium re-joined the Gaunt team for Sunday's effort. Kennington has confirmed he will run more races in the #96 later this season. The Truck Series takes the Memorial Day weekend off and returns at the start of next month as a companion event to the Verizon IndyCar Series. Brian Keselowski tweeted on Thursday that he and a number of he fellow crewmen were released by Jay Robinson's truck team. Keselowski and his group had been instrumental in preparing the team's Chevrolets for Robby Lyons and Wendell Chavous, which have made marked progress over the past year. A snapped fan belt can be a costly repair, particularly in the world of stock car racing. But only once in NASCAR’s top three series has a fan belt been the actual listed reason out for a driver who finished last. That time was August 16, 1959, during the Western North Carolina 500 at the Asheville-Weaverville Speedway. A 41-car field filled the half-mile oval that day, including 32nd-place starter Brownie King in his #31 1957 Chevrolet. The Tennessee-born King, competing in his fourth season on the tour, made it just 44 laps before his fan belt let go. He edged Joe Weatherly for last place as Weatherly’s engine failure occurred on the same circuit. King made 97 Cup starts in his career with a pair of 5th-place runs – one each at Columbia and Hickory – as his best.